Warning: This review contains spoilers for all three episodes of Ordeal by Innocence. 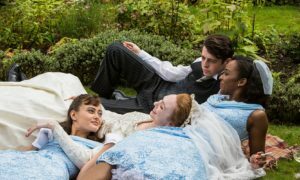 Ordeal by Innocence is the latest Agatha Christie television adaptation by the BBC, based on the novel of the same name about the death of the mother of five adopted children. 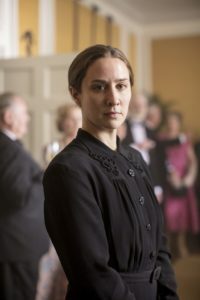 The three-part miniseries was written and produced by Sarah Phelps, who was also behind the two previous successful adaptations of And Then There Were None and Witness for the Prosecution. 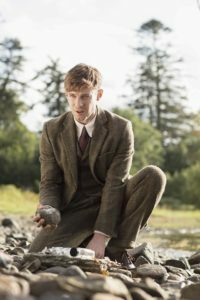 These Agatha Christie specials are supposed to be part of the BBC Christmas programming and this was the case for the first two but because of some necessary re-casting, Ordeal by Innocence aired only this April. 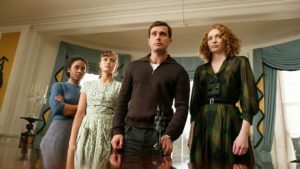 Like its predecessors, Ordeal by Innocence boasted an all-star cast, period-appropriate costumes, and a luxurious setting. Every member of the cast delivers a fantastic performance and the whole series plays out with so much suspense and even some element of terror. This, I feel, is an Agatha Christie adaptation done right. Like Witness for the Prosecution, which was based on a short story, the characters of Ordeal by Innocence were given more detailed backgrounds, with some changed completely (but I’ll get to that later), and the already somber plot was given another layer of post-war trauma and paranoia. The stories became darker, which is saying something since all Agatha Christie novels involve at least one murder. But unlike And Then There Were None, which was a pretty faithful adaptation of the original novel, Phelps took more creative liberties with the plot of Ordeal, drastically changing the ending including the culprit and the motive for the murder. Most of the characters are also very different from their book versions, with some changes working to their favor while others were not so successful. I will get into more detail on these later on in this review. “We keep thinking of the 50s as though it was this dull age when we’d won [the war], and everything was calm and nice with non-stop street parties but behind that is a very different story…There’s a fear simmering all the time and a sense that even though we’re all smiling away, there’s blood running through the bunting. “When you think about the second world war, and about what follows it, then how would you actually live, knowing about the ovens and the chimneys, the piles of bodies and the twisted spectacles? How would you live, knowing that we have harnessed a power that can sear a human being into a shadow on a stone? The biggest deviation from the novel was the identity and motive of the killer, and this is tied to many of the changes to the characters’ back stories as well. In the book, it was Kirsten Lindstrom (a middle-aged Scandinavian woman) who killed Rachel after having been seduced by Jack. When Kirsten finds out that Jack has been secretly married, she does not come forward to save him and he dies of pneumonia in prison. The television adaptation is even more grisly. Leo Argyll is revealed to be the killer and Jack’s real father too. Before the murder took place, Rachel angrily tells Jack that he is the son of Kirsten and the young man figures out that he has been the result of his father assaulting his mother when she was very young. He threatens to reveal this ghastly history to everyone and so Leo uses his contacts to have Jack murdered in jail. But Kirsten and the other children discover the truth, after Leo also murders Phillip (something that did happen in the book) and they confront him with it. In a final twist, the miniseries ends with Leo seeming to have committed suicide by jumping into the lake, much to Gwenda’s despair. But in reality, Leo is alive and imprisoned in the nuclear war bunker Rachel had built in the basement of the manor. The final shot is of Kirsten walking away with a triumphant smile, having achieved her revenge and reclaimed her agency from a former oppressor. It’s a powerful scene with a meaningful message. I would have been more impressed if I hadn’t seen the same twist ending done less extravagantly in the fourth episode of the last season of Inside No. 9. (A brilliant show which isn’t getting as much attention as it deserves). Nevertheless, I wasn’t displeased or disappointed by this ending since there was enough in the writing to justify it and though it was pretty cliché as far as culprits go (the husband did it, groundbreaking), it was the execution (pun intended) of the whole story that was the real payoff. The build-up to this ending was of course supported by the vastly different background stories given to the main characters. As mentioned above, Jack turns out to be Kirsten’s son and not her lover, and so his portrayal in this version is more sympathetic than in the book. In the flashback scenes, he is shown to be a loving and supportive sibling, despite his problematic tendencies. And his death is made more tragic because he was truly innocent of the crime. Leo Argyll is a monstrous character in this version, impregnating Kirsten when she was a minor and having an affair with Gwenda while he was still married to Rachel. Not to mention, he was the killer. He was a more sympathetic character in the book, never having any affairs, genuinely loving Gwenda, and being innocent of any crimes. The most intriguing changes were made to Arthur Calgary’s character and backstory. In the novel, he is presented as a very credible witness, a renowned physicist who had been on a remote mission in the Arctic so he was prevented from proving Jack’s innocence. Calgary in the show is the opposite. Although he is still a physicist, he was never in the Arctic but really confined in an asylum because of mental illness. He is unstable and therefore unreliable as a witness. He did use the story of the Arctic mission as an excuse but is forced to tell the truth when none of the Argyll’s buy his initial story. (Which I find amusing since Luke Treadaway was in Fortitude). But his motives are genuine because it turns out he was one of the scientists who completed the formula for a nuclear weapon. He has visions of mass destruction and death and he is wracked by guilt. His coming forward to save Jack was what he believes to be the “one good and true thing” he could do with his life. Leo Argyll has him sent back to the asylum but the end of the series shows the Argyll siblings coming to visit, and supposedly, free him. Sadly, some of the changes to the female characters have a tinge of misogyny about them. Gwenda was a simple, sincere girl in the book, who truly loved Leo. In the series, she is portrayed as the stereotypical seductive secretary who wants to marry the boss. Rachel was a misguided but ultimately good-hearted mother in the book, and only just a bit of a control freak. Though Anna Chancellor is majestic, her Rachel is extremely controlling, manipulative, and at times even cruel. Everyone has a motive to kill her. Other relationships have also been altered significantly. Tina and Mickey get together much earlier in the miniseries than they do in the book, and this fact is what causes some friction between Tina and her mother before the latter dies. In the book, Hester and Arthur Calgary eventually get together but this is dropped completely in the series though this is understandable because both characters haven’t known each other that long and are suffering their own traumas. There might be some hope for them to develop something in the future, as soon as the Argylls get Calgary out of the asylum. But that’s left to the viewer’s imagination. 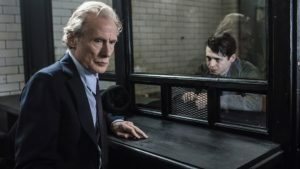 Whether or not you agree with the changes made to the plot and characterization, you have to admit that Ordeal by Innocence is still a fantastic piece of television. All three episodes are filled with atmospheric scenes, masterful performances, and a truly gripping story. The tension never lets up and since we knew going in that the ending had been changed, even book readers were not sure how the story would end. Ordeal by Innocence is essentially the story of a fractured family, full of dark secrets, and repressed desires. With so much tension around them, someone was bound to snap. But after reaching breaking point, and with their painful history exposed, they have faced the truth in all its complexity, and they can now finally start to heal.